Annette Smith of the Morecambe Bay Foodbank. The extent of child poverty across the district has led to many youngsters now suffering from rickets, an investigation has found. 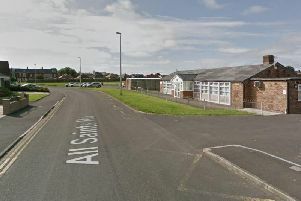 An ITV report aired this week showed some families in Morecambe were struggling so much that schools are now helping them to wash clothes and charge mobile phones as well as providing schoolwear for some youngsters. Latest figures from the End Child Poverty coalition show that almost a quarter of children in the Lancaster district are living in poverty. Figures suggest that after housing costs have been taken into account, 3,863 children (25.5 per cent) are living in poverty in the Lancaster and Fleetwood parliamentary constituency, and 5,087 in Morecambe and Lunesdale, 26.4 per cent. The wards with the highest levels of child poverty are Heysham North with 36.43 per cent and Westgate with 34.22 per cent. Siobhan Collingwood, head at Morecambe Bay Primary School, said the school now provides a daily laundry service for families who don’t have washing machines or cannot afford the electricity. The school has also made present and food packages for children who are not expected to have any kind of Christmas celebrations at home. “We have asked the children what they want and they don’t come back saying a mobile phone or an iPad, they come back saying they want heat or a roof over their head or food and somebody to love them,” Mrs Collingwood said. Gill Burns, support worker at West End Primary School, said: “We have given out shoes and coats and are allowing parents to charge up their phone in school if they haven’t got the electricity. “We can tell if a child looks different from one day to the next. We are vigilant. As a result, Carnforth GP Dr Andy Knox said rickets – a condition usually seen in developing countries where bones do not form properly – is now making a comeback. “We have seen things like rickets and other conditions that are associated with malnourishment,” he said. “It’s an awful situation to be in when you are sitting wondering if you are going to be able to provide food for your child,” she said. “It’s heartbreaking. Annette Smith from Morecambe food bank said: “We have had parents here that are crying and have delayed coming in for two weeks because they are really scared somebody would be judging them. Morecambe MP David Morris said: “These claims always seem to emanate from a primary school in Morecambe and the same doctors’ surgery in Carnforth. I have referred these claims in the report to socialservices and the claims regarding rickets to the Department of Health. “It is vital that the extent of these claims is established by officials and that social services are fully aware of all of the families affected by the claims made in this documentary as it is their job to protect all children.